What an especially beautiful spring and summer we’ve had. Ideal for messing about on the water. So we did this quite regularly on various boats with a different crew each time. This spring was packed full of water sports experiences. 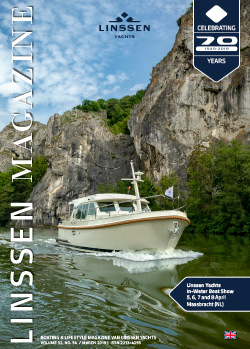 Starting with the annual Easter tour, where we sailed on 10-15 Linssen yachts from Maasbracht along the Willems Route via Weert, Maasmechelen (Belgium) – with a short stop in Rekem (Belgium) – to Maastricht, and back to Maasbracht along the Juliana Canal on Easter Monday. It was (still) cold at that time, but we had another nice group of Dutch and international Linssen owners who were all happy to get a visit from the Easter bunny during the trip. Experiences were exchanged and new contacts made. Another memorable moment this spring was the opening of Jonkers Yachts’ showroom in Port Zélande Marina. Together with Russell Currie (CEO of Fairline), we put the Jonkers team in the spotlight. And deservedly so. It has become a beautiful showroom. If you get the chance, it’s definitely worth the effort to take a look inside. The event was not only organised down to the last detail, it was also a very friendly occasion. I am sure the people who were there will wholeheartedly agree. The best moment for me personally was the flotilla. There were 27 (!) Linssens sailing across the Grevelingenmeer and I’ve never been so proud. Absolutely fan-tas-tic. It was incredibly beautiful to see so many like-minded people together. The picture (on p 43) will give you an impression. This summer, for the first time, we took our family sailing for three weeks on our own “Henri Mer”. We sailed to Zeeland via Well (Leukermeer), to spend a few days with family and friends. Mathijs (6) wanted to catch crabs. Well, we knew that. Every day he stood ready to leave, his bucket and fishing rod in his hands. The children of our “neighbours” in the marina (Isabel and Olivier) went along. An hour later they proudly came to tell me that they had caught as many as 14 crabs. He’s still talking about it. After that, we continued to Blankenberge, our children’s first taste of a sea trip. Mathijs marvelled at all the big ships and Sophie (4) thought it was really exciting.